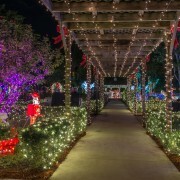 Hoffman’s Chocolates is pleased to announce that its 27th Annual Winter Wonderland will open to the public on Saturday, November 18 and it will be adding an exciting new attraction this year — Panthers in Palm Beach Ice Skating Rink presented by the Florida Panthers. 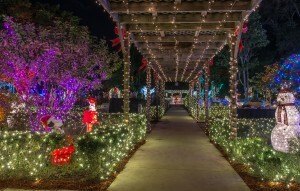 The 2,400 square-foot, outdoor ice skating rink will be located in front of Hoffman’s Chocolates Factory, Shoppe, Ice Cream Parlour and Gardens in Greenacres (5190 Lake Worth Road). Made with real ice, the rink will be kept cool at 32 degrees for guests to enjoy a true outdoor ice skating experience in South Florida. Featuring more than 125,000 LED lights, captivating holiday displays, a giant Christmas tree, live entertainment, and photo opportunities with Santa and Mrs. Claus, Winter Wonderland will be open nightly, November 18 through December 30, from 6 p.m. – 10 p.m. and is FREE to the public. Panthers in Palm Beach Ice Skating Rink will be open November 18 through December 30. Ice skating tickets will be $15 each for general admission; $13 per person for groups of 10 or more; and $10 per person for military veterans and first responders; for a 60 minute skate session. The cost includes skate rental. Hours of operation for the ice skating rink will be Monday through Friday, 3 p.m. – 10 p.m.; and Saturday and Sunday, 12 p.m. – 10 p.m. Both Winter Wonderland and the ice skating rink will be closed on Thanksgiving Day, and Christmas Day. The rink will have early closure on Christmas Eve at 6 p.m. (Winter Wonderland will be closed). In addition to the Panthers in Palm Beach Ice Skating Rink, Hoffman’s Chocolates will also introduce its new Holiday Chocolate Class and Factory Tour with Santa. The exclusive tour will include a behind-the-scenes tour through Hoffman’s Chocolate Factory, a meet and greet with Santa Claus, a special chocolate craft and a scoop of Hoffman’s ice cream. Space is limited and the cost is $24.95 per. Guests can visit www. hoffmans.com for more details and to purchase ticket. Hoffman’s Chocolates will also host its 2nd Annual Circle of Celebration Holiday Wreath Display and Contest at Winter Wonderland to support local nonprofits in the South Florida community. The gourmet chocolatier has invited 10 nonprofit organizations total from Palm Beach and Broward County to decorate custom wreaths that will be displayed at Winter Wonderland. Throughout the holiday season, Winter Wonderland guests will be able to vote for their favorite wreath. Hoffman’s Chocolates will then donate $1,000.00 to the winning organization. Each participating nonprofit will receive a 48-inch wreath and $250 from Hoffman’s to cover the cost of supplies needed to decorate the wreath. The winning wreath will be announced on January 8, 2018. San Francisco Puffs & Stuffs Inc. Concessionaire will be onsite serving delicious food onsite for guests to enjoy. Panthers in Palm Beach Ice Skating Shoppe will be located adjacent to the rink where guests can purchase Florida Panthers merchandise including T-shirts, hats and gloves. Hoffman’s Chocolates’ festively decorated Factory Shoppe & Ice Cream Parlour will offer mouthwatering treats for the whole family including seasonal ice cream flavors and Hoffman’s seasonal Milkshakes. Hoffman’s Chocolates Shoppe is also the perfect destination to find the sweetest holiday gifts. Hoffman’s gourmet chocolates, specialty gifts and gift baskets are perfect for family, friends, loved ones, teachers, stocking stuffers and corporate gifts. Hoffman’s Chocolates can ship to anywhere in the U.S.
Sponsors for this year’s Winter Wonderland include: BankUnited, Northwestern Mutual, MOD Pizza, FPL, Florida Sugar Cane League, All About Closing, Inc., KeyStaff, L Seven Solutions and Greenspoon Marder. For more information on the Panthers in Palm Beach Ice Skating Rink, please visit www.facebook.com/PanthersHolidayRinks or www.nhl.com/panthers/community/panthersinthepark. Monday through Friday 3 p.m. – 10 p.m.
Saturday and Sunday 12 p.m. – 10 p.m.
Every Friday, Saturday and Sunday beginning November 24th – December 23rd from 6 p.m. – 10 p.m.
Beginning December 14th, Santa will be there every night from 6 p.m. to 10 p.m.